3-Tiered design displays more products in less floor space! Do-it-yourself set up saves money on shipping and takes just minutes! 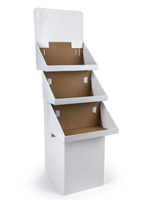 Cardboard display stand is an economical alternative to pricier store fixture stands! This bin display is perfect for displaying items in a retail store. 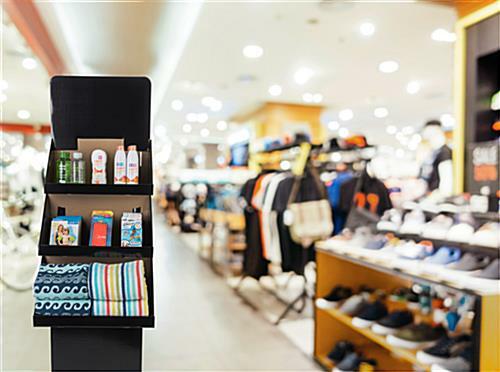 The 3-tiered bin display, also known as a cardboard store fixture, can move slow-selling products off crowded shelving units and into the aisle, where customers and patrons can't miss them! 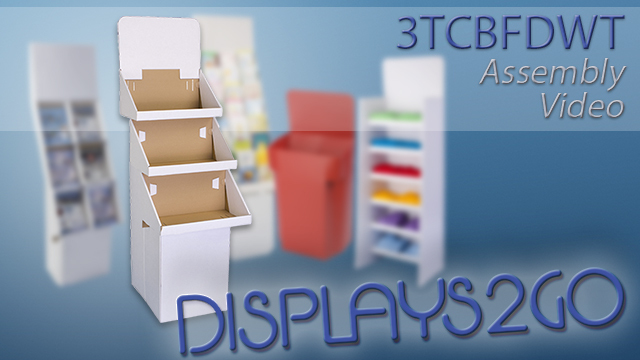 Fill this retail display stand, bin display with sale or clearance items and watch them disappear! 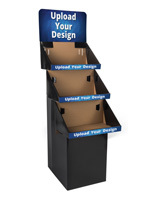 The bin display even features a removable header for attracting more attention! 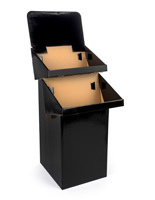 This cardboard dump bin, bin display is crafted from black-coated corrugated cardboard to coordinate with almost any retail setting. 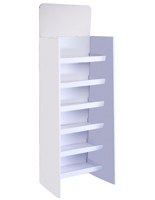 The three-tiered design of the retail display stand allows retailers to showcase products vertically, using minimal floor space. 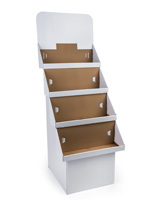 This multi-tiered design also ensures that the more items you put on the lower shelves of your bin display, the sturdier the bin display becomes. 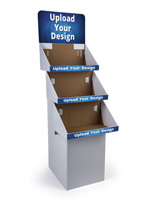 This cardboard bin display stand is a great alternative to pricier wire dump bin displays. 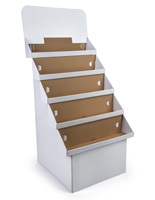 The bin display features three 20-1/2" wide by 10-1/2" high by 12" deep bin compartments. 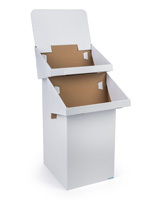 This bin display is intended to hold neatly packaged and/or free-standing items, like boxed food or books. A removable header allows retailers to display signage atop the bin display, as well! 22.5" x 65.8" x 27.5"
20.5" x 10.5" x 11.5"
While the directions are not clear the unit was easy to assemble. The black color was vibrant. It will work for the purpose it was ordered for. Thank you. We are sorry that you had some issues assembling this item, Ed. For future reference, if you ever have trouble putting together one of your products, our customer care team will always be happy to assist you with that. They are available via phone, live chat, or email. Posted 2 years ago by Ed F.